Wabbits…*Cough* Sorry, rabbits, as you may know are not native to the UK. They were introduced to the country in the 2nd Century when the Romans realised they could easily farm them. In the early days Rabbits were kept in Fenced off scrubby areas, but just like El Chapo, the rabbits quickly tunnelled out of these prisons. These incredible escape artists were soon guarded as closely as the Emperors own palace. Over the coming years as trade amongst countries grew, they began travelling around the world being shipped to almost every continent as an easy food source. Thanks to their Houdini like escaping skills and their incredibly quick breeding cycle, Rabbit numbers quickly started growing at an unprecedented rate. In the 1950’s Britain decided that Rabbit numbers had grown too far. As a result the whole of the country was declared a rabbit clearance area under the Pest Act 1954. This act meant that people were legally allowed to control rabbits on their property using Gas, Traps, fencing, ferrets and shooting. To this date the act is still in place and if you are a land owner you need to be aware of your responsibilities. Especially as the secretary of state for the environment can enforce Rabbit control measures and even prosecute you if nothing is done. But Rabbits are cute and cuddly! I know what you are thinking, but Rabbits are cute and cuddly and don’t do any harm. Rabbits are a major pest species in the UK and the damage they cause is quite often underestimated. 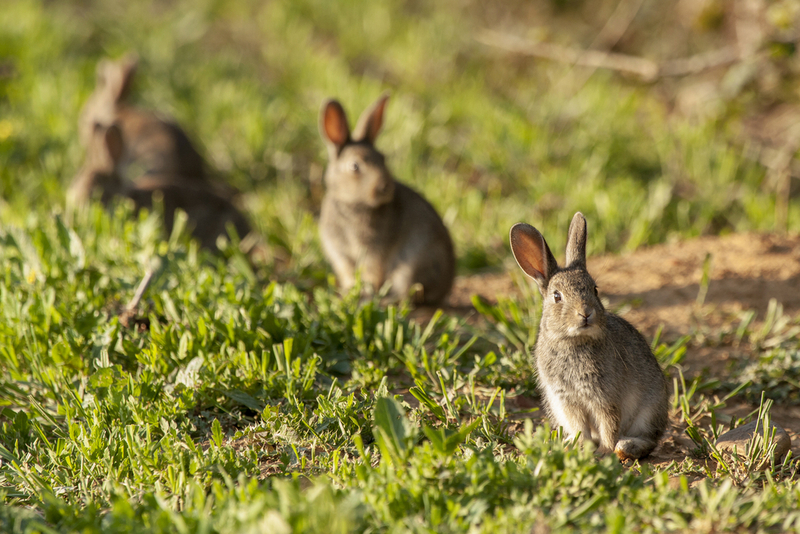 7 Rabbits will eat as much as a sheep, allowing even a small population to dessimate a crop. This costs the agricultural industry hundreds of millions of pounds a year. Livestock can be left to starve as Rabbits clear fields of all grazable land in a brief period of time. The same livestock can be seriously injured by getting limbs trapped in rabbit warrens. This can lead to extremely expensive vet bills or even the animal being put down. It’s not always the farming community that suffers, sports grounds and public areas often face huge health and safety issues. Due to the damage rabbits do digging and scrapping around the fields. Rabbits even have a sadistic need to chew wires above or below ground, whether they are live or not. Sometimes leaving homes and businesses without required resources. In general rabbits leave a trail of destruction behind them, which can only be managed by controlling the rabbit population. As of 2017 we have introduced our monthly Rabbit Management scheme. Our team of experienced pest control technicians, will attend your site and provide regular Ferreting and shooting services. You may be thinking “why do I need a business to do this? My mate down the road has a gun and he will do it for free”. The problem is most of the people out there asking for permission to hunt rabbits on your land do this for sport. Therefore, it is in their interest to allow the rabbit numbers to keep growing, otherwise what would they hunt? This leads to irregular visits with minimal numbers being culled and is likely to still leave you with crop, livestock and land damage. The only way to reduce this damage is with a professional service designed to eradicate and then manage the numbers of rabbits on your land. Give us a call to find out what we can offer to help. You will be pleasantly surprised by the price.